The iPhone 4S has been marred with problems and security issues since it launched earlier this month and, although it's a great phone, as we mention in our Apple iPhone 4S review, flaws in the device and its iOS 5 operating system are still being found. Which is why we've pulled together a list of the problems you will or would have experienced with the new iPhone, including OS and security flaws, so you know exactly what you're getting – that is until Apple decides to fix the software glitches, most probably in the form of a software update. Some iPhone 4S users are finding that when making an outgoing call the phone mutes the handset making it impossible to hear what the person on the other end of the line is saying. While initially considered to be just a minor issue the fault has now come under the spotlight of the Apple support forums with thousands now getting involved in the debate to try and ascertain what exactly is causing the problem. Confirmed on all three US carriers and now being picked up in the UK the fault is believed to be some form of driver issue with iOS 5. At present there has been no official word from Apple and no official fix, however if users are finding that they're also having problems making calls then general advice has been to try turning the speakerphone on and then off again and also plugging in headphones, of course, these aren't fixes merely ways of getting around the problem. Apple's virtual assistant Siri was supposed change the way we use our mobile phones. Instead of typing and trawling the net to find information for ourselves, Siri aimed to cut all that out by doing the heavy lifting for us. But a few flaws in the make up of the software have caused major concern among the media and customers alike. 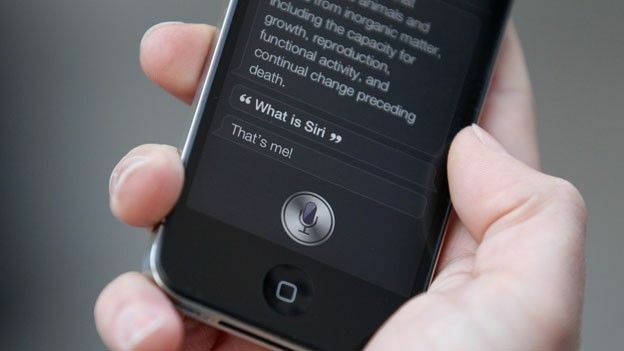 Siri has been the subject of several reports concerning a worrying security flaw. At the press of the Home button, a person is able to send texts, emails, make calls and request calendar information without having to unlock the homescreen using a passcode. That, of course, could prove very costly indeed if someone gets their mitts on your handset. But the setting isn't a permanent one - users have the option of switching it off by disabling the option to enable Siri at passcode lock - however, Alan Goode, managing director of mobile security firm Goode Intelligence, argues that because this setting was set at default without users' acknowledgement, many iPhone 4S owners would have been unaware of the potential risks they were exposing themselves to. When the iPhone 4S first launched last month, users took to Twitter and forums to vent their frustration at Apple's virtual assistant application, Siri, claiming that it didn't work. When asking a question, users were greeted with an error message informing them that the app “cannot connect to the network." Several outlets have reported that the issue can be fixed by first turning Siri off in the settings menu, then going to Settings > General > Reset > Reset All Settings. T3 did this and found that although it reduces the frequency of the problem, it doesn't solve the problem completely. It is believed that Apple will fix Siri-related problems in a new software update – hence why it was released in beta – but not much information is available from Apple on this front. This isn't a problem per say, but users may have been given the impression that the iPhone 4S body is 100% identical to that of the iPhone 4. It's not. The mute button has moved slightly lower, and although most iPhone 4 cases can fit onto the device, covers that have holes cut out specifically for the mute button won't fit – they'll simply cover it up. So be warned – don't buy expensive cases unless you're certain they'll fit or are specific to the iPhone 4S. The Apple iPhones have never been known for their long battery life and it would seem the iPhone 4S is no different. In fact, the Apple news-dedicated website iLounge reports that the battery life gets considerably drained when using 3G data and audio/video playback/recording on the 4S. Fortunately, you can read Apple's iPhone battery power saving tips to see how you can save some much-need handset energy. When they launched last year, the Apple iPhone 4 and Apple iPad 2 both aroused suspicion among Apple devotees when some of their screens sported a faint yellow discolouring. Apple put this down to the adhesive used to glue the device together not curing properly and the problems seemed to have disappeared after just a few weeks, which could be the case with the iPhone 4S. Several users on Apple forums have complained about the exact same problem occurring on their iPhone 4S handsets, but whereas the discolouring in previous Apple devices saw yellow spots dotted around the screen, this time round it's encompassing the whole touchpad, leading to complaints from Apple fans worldwide. If you've got the same problem and it hasn't gotten any better throughtout the weeks, you're best bet is to contact Apple customer services: 0800 048 0408. Lines are open Monday-Friday 08:00-21:00, and Saturday-Sunday 09:00-20:00. Apple fans were hit with an iOS 5 error 3200 message on October 13 as they attempted to download the tech giant's latest mobile operating system. It was believed the company's servers were swamped by demand, causing thousands of users to face continued error messages. The Error 3200 message greeted 'hundreds of thousands' of users across the globe as they attempted to update their existing Apple iPhones, iPads and iPods to iOS 5, ahead of the Apple iPhone 4S release date which took place on October 14th.